Even after I heard that this product was coming out, it took me a long time to finally get a picture of it. 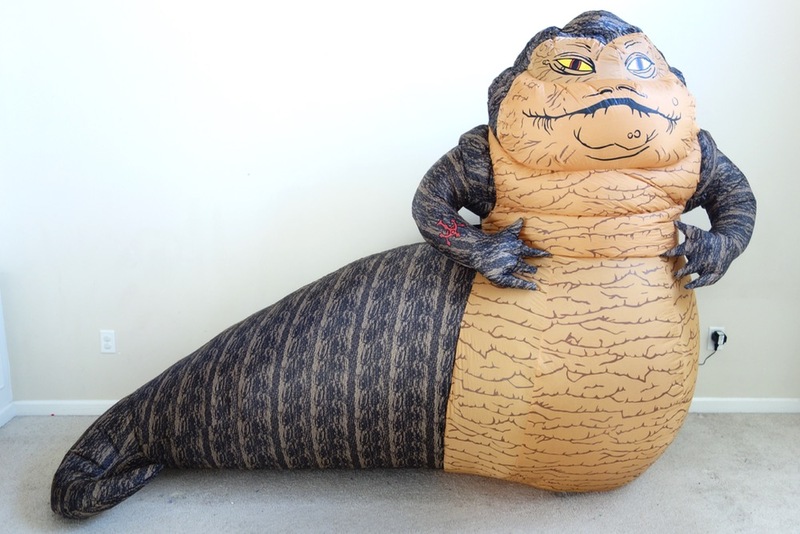 It never occurred to me that two companies would be releasing inflatable Jabba the Hutt decorations this year, so when I saw the decoration I mentioned in a recent post, I figured it was the Morbid Enterprises version. Not so. That version is manufactured by Gemmy Industries, and I apologize for any confusion I may have caused. I hope to get one of the Gemmy versions to review separately. I’ve been seeing more and more of this style of air-blown inflatable lawn decorations in recent years. I’ve never had one myself, but then again I don’t really do much in the way of decorating for the holidays. There’s a surprising number of them available in every conceivable style, including Star Wars characters. These kinds of things tend to focus on characters like Vader, Yoda and the droids, though, so I was happy to see that they were making a Jabba. And when you think about it, it makes sense since this is about the only way to make an affordable life-size Jabba the Hutt. You just have to take it out of the box and plug it in, and it will inflate automatically in about 2 minutes. This kind of decoration has to have a fan going at all times or it will quickly deflate. In terms of its size, it’s really very impressive. It’s hard to convey this without seeing it in person. My kids kept wanting to hug him. The design is a little goofy if you look at it closely, but it’s not bad. And from a distance on your lawn or maybe at a party I think it’s just fine. 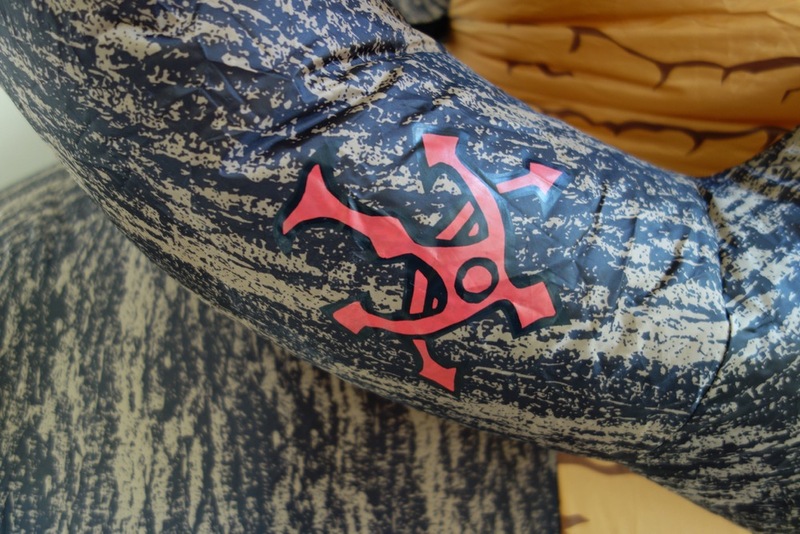 They got his major features, including his tattoo. I do kind of wish they had used a different color scheme, though. This is basically the same color scheme as the Rubies Jabba the Hutt costume, which is based on the Clone Wars Jabba design. 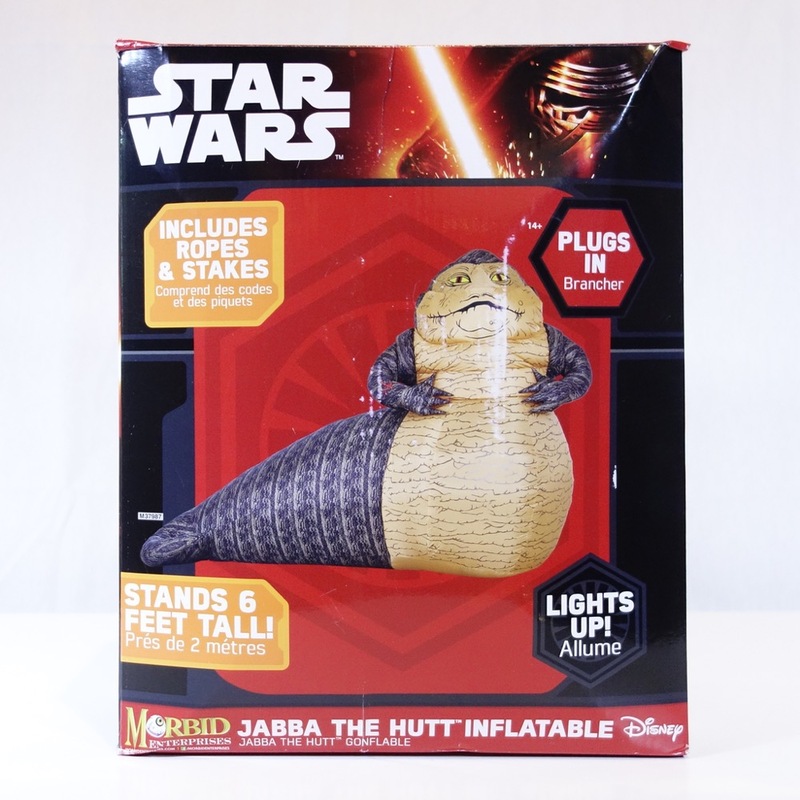 The brownish color doesn’t translate all that well for a Return of the Jedi Jabba. 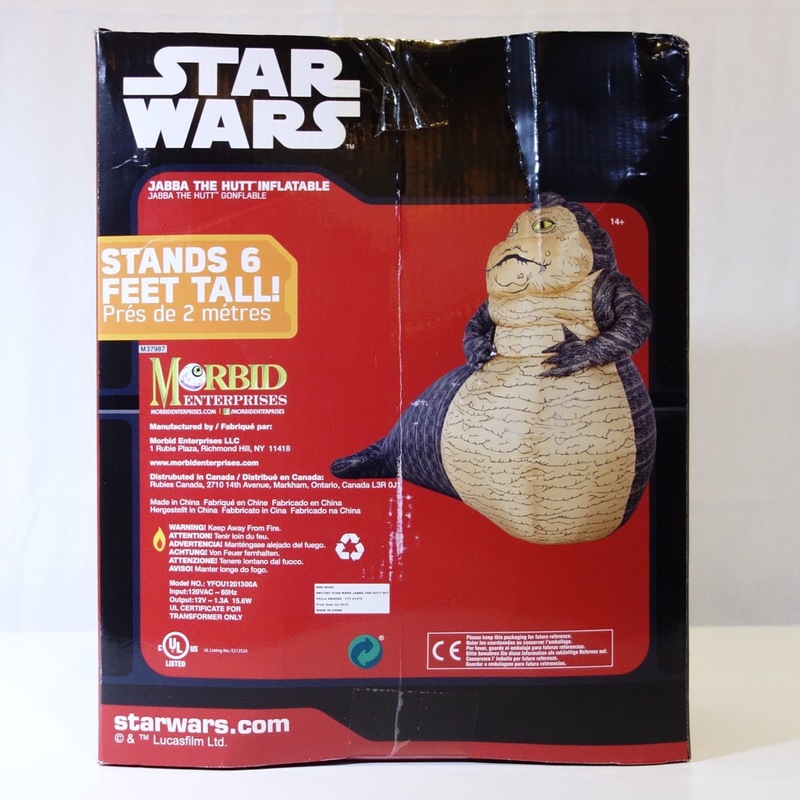 There’s nothing Halloween-specific about the design, so it could do double-duty at a Star Wars-themed party, or even become a Christmas decoration with the right accessories (Santa hat and scarf, anyone?). I’ve seen prices for this up to $180 from some places, but the retail price is apparently $120, and I got mine for $99 from yardinflatables.com. (I have no affiliation with them whatsoever, but I got my order fast and they were the cheapest I could find.) Check out the YouTube video below for a quick review of this piece.